Fourth ventricular outlet obstruction may be congenital or acquired. Congenital lesions occur primarily in children and are the subject of many reports on Dandy-Walker cysts. Acquired ventricular outlet obstructions are reported in both adults and children. This abstract presents two adult patients with congenital occlusion of the foramen of Magendie causing massive dilatation of the fourth ventricle and hydrocephalus. Both patients underwent radiographic evaluation. The characteristic appearance of the fourth ventricular outlet on these studies provided sufficient evidence to warrant posterior fossa exploration. Two patients presented with non-focal signs of increased intracranial pressure without a mass lesion and hydrocephalus, but with a disproportionately large fourth ventricle. The presence of a membrane occluding the foramen of Magendie was established with metrizamideenhanced CT and ventriculography, in conjunction with pneumoencephalography to visualize the inferior border of the occlusion. Stasis of metrizamide in the cisterna magna, as seen in these cases, was thought to be evidence of incomplete communication between the fourth ventricle and the subarachnoid space. 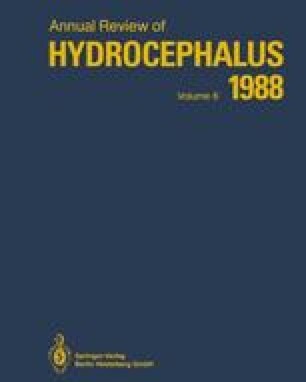 The presence of semi-permeable membranous perforations, or of hinged or irregularly dissected membranes, could explain the delayed onset of symptomatic hydrocephalus in our patients. Semiperforate foramina of Luschka may have been sufficient to allow some CSF for prolonged periods of time. The fourth ventricle may have dilated slowly while CSF continued to flow at subcritical rates until decompensation occurred, leading to symptomatic intracranial hypertension.